Cropped from an earlier post, an illustration by artist Ruth Welch Siver, circa 1922. Signed, Ruth K. Welch, Ruth Welch Siver, Ruth W. Siver and Ruth Siver…. Ruth K. Welch was born September 9, 1871 in Pennsylvania, to Pennsylvania natives James M. Welch and Mary E. Mason. From census records Ruth was the middle child of seven: oldest to youngest was Viola, Jessie, Edward, Ruth, Grace, George and Florence. The 1870 census shows the parents, and children Viola, Jessie, and Edward, living in Curwensville, Clearfield County. 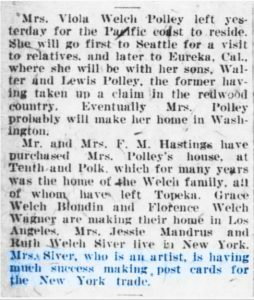 Sometime after Ruth was born in 1871 and before Grace was born in 1876 the family relocated to Iowa, and relocated again after George was born in 1878 in Iowa, to when youngest child Florence was born in Kansas in 1883. Ruth was teaching in WaKeeney, Trego County, Kansas in 1894 – 1895. 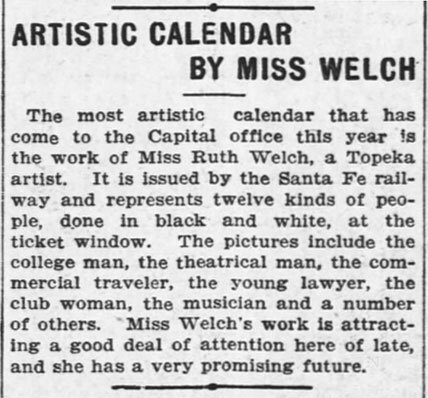 The 1900 Federal Census for the Welch family in Topeka shows their address as 709 Topeka Avenue, and Ruth’s occupation as artist. 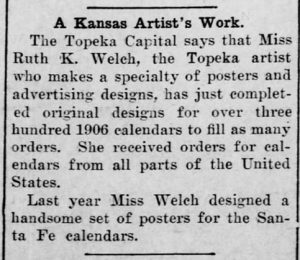 The following clips from The Topeka Daily Capital, Jan. 4, 1905 and The Ottawa Daily Republic, Jan. 3, 1906 inform us that Ms. Welch was working in the poster, advertisement and calendar field; of particular mention in both articles is the well-known Santa Fe railway calendars. See D.L. Briscoe’s tribute: “Santa Fe Calendar History” for background. 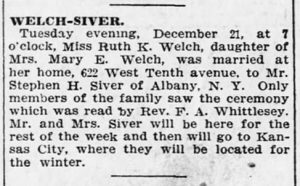 Ruth married Stephen H. Siver on December 21, 1909 in Topeka, Kansas: Stephen was born February 27, 1884 in NY and died March 20, 1981 in FL. They had no children. 1915 – occupation housework, in Albany, NY at 56 Elberson Place, with husband Stephen. 1920 – occupation artist, with husband, at 215 109th St. in Manhattan, NY with Ruth’s sister, Jessie Landers. 1925 – occupation writer, with husband, living at 231 W. 96th St. in Manhattan. 1930 – occupation artist in modeling industry, single, living at 231 W. 96th St., Manhattan. 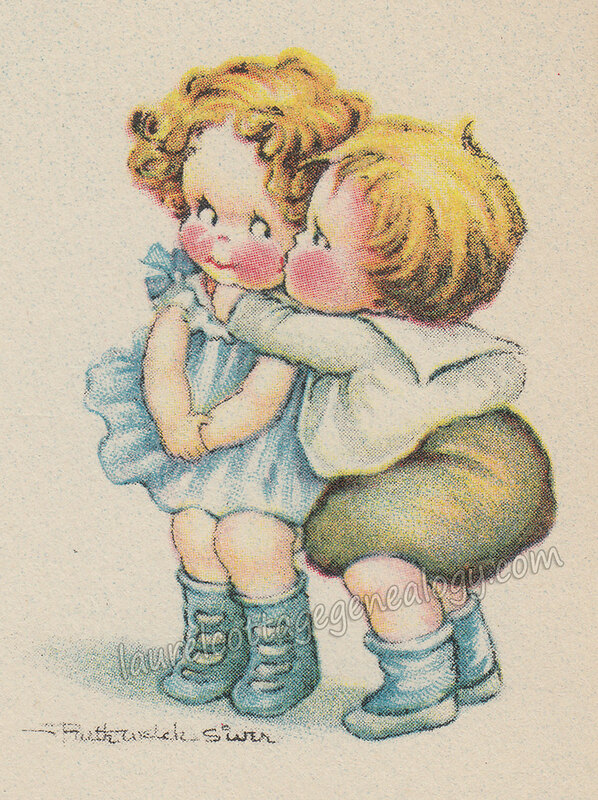 Ruth Welch Siver died October 7, 1933 in the Bronx, New York, and though we wonder what became of her earlier work, her charming illustrations in the valentine and postcard industry, with their cute, funny/quirky captions, live on. Sources: The Topeka Daily Capital, March 26, 1920. Friday, p. 6. (Newspapers.com). Year: 1870; Census Place: Curwensville, Clearfield, Pennsylvania; Roll: M593_1327; Page: 325B; Family History Library Film: 552826. (Ancestry.com). Year: 1880; Census Place: Trego, Kansas; Roll: 398; Family History Film: 1254398; Page: 306C; Enumeration District: 314. (Ancestry.com). 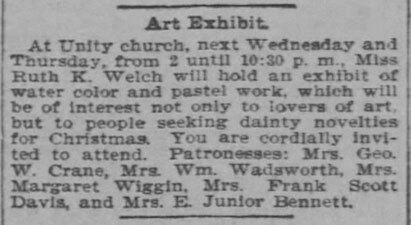 “Trego Teachers.” Western Kansas World, (WaKeeney, Kansas) October 27, 1894. Saturday, p. 2. (Newspapers.com). Year: 1900; Census Place: Topeka Ward 4, Shawnee, Kansas; Roll: 500; Page: 11A; Enumeration District: 0158; FHL microfilm: 1240500. (Ancestry.com). “Nathaniel Sichel.” (http://www.artnet.com/artists/nathaniel-sichel/) Web accessed April 1, 2018. “Art Exhibit.” The Topeka State Journal. November 17, 1900. Saturday, p. 5. (Newspapers.com). “The Queen of the Harem.” The Topeka State Journal, November 17, 1900. Saturday, p. 5. (Newspapers.com). “Santa Fe Calendar History.” (http://dlbriscoe.com/santa-fe-railway-calendars.html) Web accessed April 1, 2018. 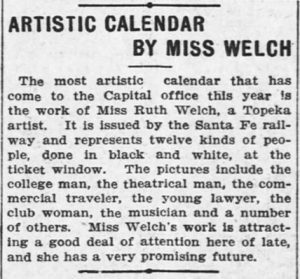 “Artistic Calendar By Miss Welch.” The Topeka Daily Capital, January 4, 1905. Wednesday, p. 3. (Newspapers.com). 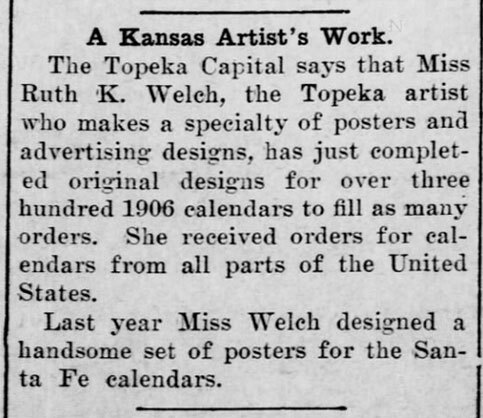 “A Kansas Artist’s Work.” The Ottawa Daily Republic (Ottawa, KS). January 3, 1906. Wednesday, p. 6. (Newspapers.com). 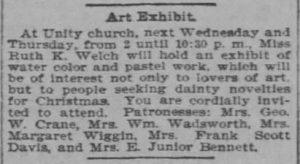 “Attention.” The Topeka Daily Capital, June 1, 1904. Wednesday, p. 2. (Newspapers.com). “Lessons.” The Topeka Daily Capital, February 26, 1905. Sunday, p. 10. (Newspapers.com). “Welch-Siver.” The Topeka Daily Capital, December 23, 1909. Thursday, p. 5. (Newspapers.com). “Stephen Henry Siver, Jr.” Florida Death Index, 1877-1998. (Ancestry.com). New York State Archives; Albany, New York; State Population Census Schedules, 1915; Election District: 03; Assembly District: 01; City: Albany Ward 18; County: Albany; Page: 22. (Ancestry.com). Year: 1920; Census Place: Manhattan Assembly District 11, New York, New York; Roll: T625_1205; Page: 3B; Enumeration District: 822. (Ancestry.com). New York State Archives; Albany, New York; State Population Census Schedules, 1925; Election District: 14; Assembly District: 09; City: New York; County: New York; Page: 20. (Ancestry.com). Year: 1930; Census Place: Manhattan, Manhattan, New York; Page: 16A; Enumeration District: 0459. (Ancestry.com). “New York, New York City Municipal Deaths, 1795-1949,” database, FamilySearch (https://familysearch.org/ark:/61903/1:1:2WGR-XV3 : 20 March 2015), James Welch in entry for Ruth Welch Siver, 07 Oct 1933; citing Death, Bronx, New York, New York, United States, New York Municipal Archives, New York; FHL microfilm 2,155,816. 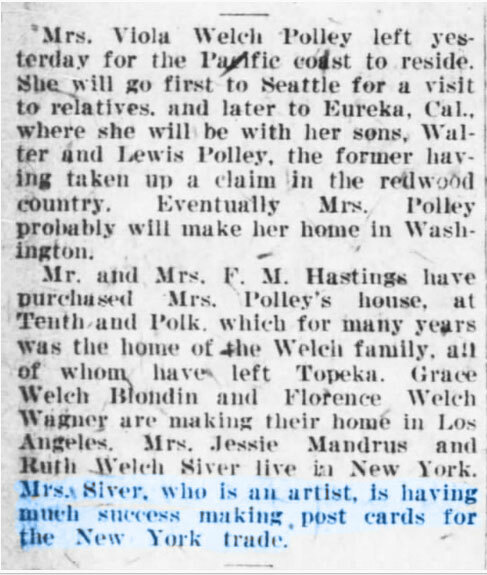 This entry was posted in Postcard Artists and tagged cute illustrations of children, Kansas artists in the early 1900s, postcard artists in the 1920s, Welch and Siver family history and genealogy by Annieoakley. Bookmark the permalink.